How to Make a Patchwork Quilt, all you need to know. 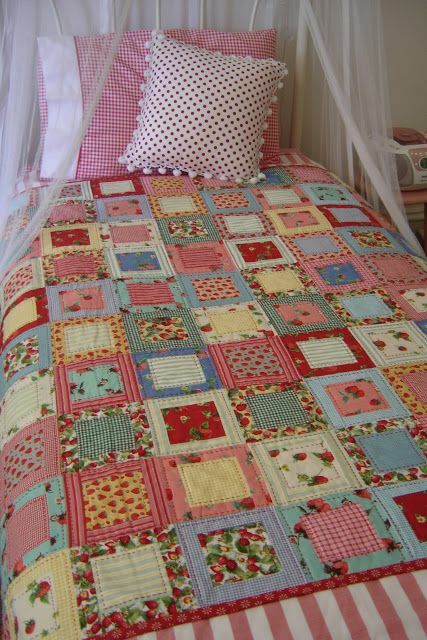 In this “How to” style guide we provide a complete guide of how to make a patchwork quilt. Read on to learn this precious art and make these decorative quilts in your own home or for family and friends. A patchwork quilt is a type of quilt for which the top layer consists of a series of fabric patches which are sewn together into a pattern to form a design. In times gone by the intention was to use up left over fabric scraps, but now patchwork quilts are very popular and decorative in their own right. The first part of the patchwork quilt design process is to select a patchwork quilt pattern. Available options include designing your own pattern or selecting a pattern online or from a book. There are a wealth of options available! Next wash and iron the fabric to be to prepare it for use. Cut the fabric into square shapes typically between 6 and 12 inches in size. Be sure to allow extra material for seaming, about quarter of an inch is usually sufficient. Stitch the square shapes together to initially join two squares together, but then join groups of patches together to form the eventual quilt. Iron the top of the quilt to ensure it is smooth and that all the sewing seams are flattened out. Stretch out a piece of fabric which covers the entire length of the patchwork design. On top of the fabric add a layer of wadding; this is the filling for the quilt. On top of the wadding add the patchwork itself and secure with curved safety pins or tack removing any wrinkles on the fabric backing and patchwork front. Start in the center of the patchwork and sew outwards making sure there are no wrinkles. Now pin one side of the strip along the top of the patchwork and pin the other side to the fabric backing. If you need help with any aspect of your patchwork quilt let us know here at Poppy Patch, we’d be delighted to help! We can supply materials, patterns and general supplies; we also run a range of regular workshops which can be helpful too. Call us on 01933 227973 to commence discussions or place an order.